Ace likes to chew, lick, and howl. He is a beagle and rat terrier mix. His dad is a full blooded rat terrier and his mom is a full blooded beagle. He is six weeks old. He is the most spoiled dogs I’ve ever seen. He is loveable, hyper, and cute. He has the body figure of a beagle and he has HUGE eyes and the long floppy ears. The only thing he has of his dad is his color. His dad is black and white, and his mom is a regular looking beagle brown, black, and white. I love this dog to death! 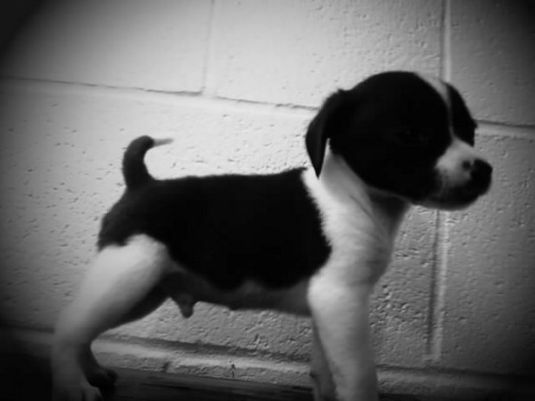 I just want one like this, I love black and white dogs... your Ace is sooooo beautiful! He is so tender! owww its soooo cute. how munch is it? i really want one!